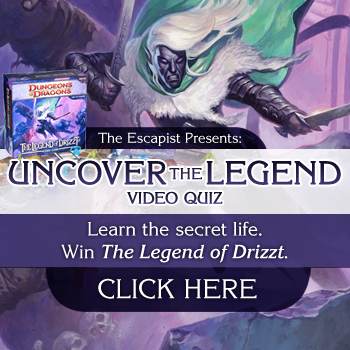 Last Chance to Enter Our Legend of Drizzt Giveaway! This time of year is saturated with Black Friday and Pre-Holiday deals. But who can compete with FREE? During The Escapist's Uncover the Legend giveaway, entering to win a free prize bundle is easy! All you have to do is watch LoadingReadyRun's video on the Secret Life of Board Games and answer 5 questions about it for a chance to win the Legend of Drizzt Board Game, a copy of the Neverwinter novel by R.A. Salvatore, the Neverwinter Campaign Setting, and booster packs of Neverwinter Fortune Cards for D&D. The adventures of Drizzt Do'Urden, as told in the New York Times best-selling Forgotten Realms novels by R.A. Salvatore, come to life in this thrilling board game. Take on the role of the legendary drow ranger or one of his famous adventuring companions, battle fearsome foes, and win treasure and glory. Designed for 1-5 players, this board game features multiple scenarios, challenging quests, and cooperative game play. The contents of this game can also be combined with other D&D Adventure System Cooperative Play board games, including Castle Ravenloft and Wrath of Ashardalon, to create an even more exciting experience. Personally, I can't think of a better way to spend your New years Eve with friends while waiting for the new year. This event ends Tomorrow, November 30th at 11:59PM EST and is open to residents of the US, Canada, UK and Australia. For all the rules of participation and how to receive the limited edition badge just for participating, click here.